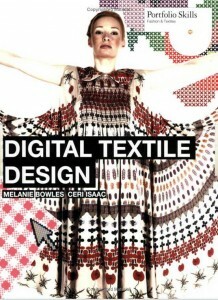 “Digital Textile Design,” by Bowles and Isaac; $23 from Amazon.com and various other book sellers. This is a difficult book to describe. While initially intended for students at British textile colleges, the techniques can really be used by anyone, and truly individually designed fabrics can be created at home or by a small shop. The lessons show you how to add a design to paper patterns, how to space out sequins and other applied materials. Or, you can skip all that and just design for whole bolts of cloth. A search on the web revealed a number of places that would both print your design and/or make your garment. Spoonflower.com, FabricOnDemand.com and KarmaKraft.com all charge around $17 a yard and up to print your design. If you want to do it yourself, you don’t need expensive equipment; Bob recalls printing a silk tie with a Canon inkjet printer.